1.Saturday, January 26, 2013-Depart Washington Union Station at Noon for New York's Penn Station on Amtrak Acela Express Train 2212. Arrive NYC at 2:55 PM.Sanctuary Hotel. 2. Sunday, January 27-NYC. Sanctuary Hotel. 3. 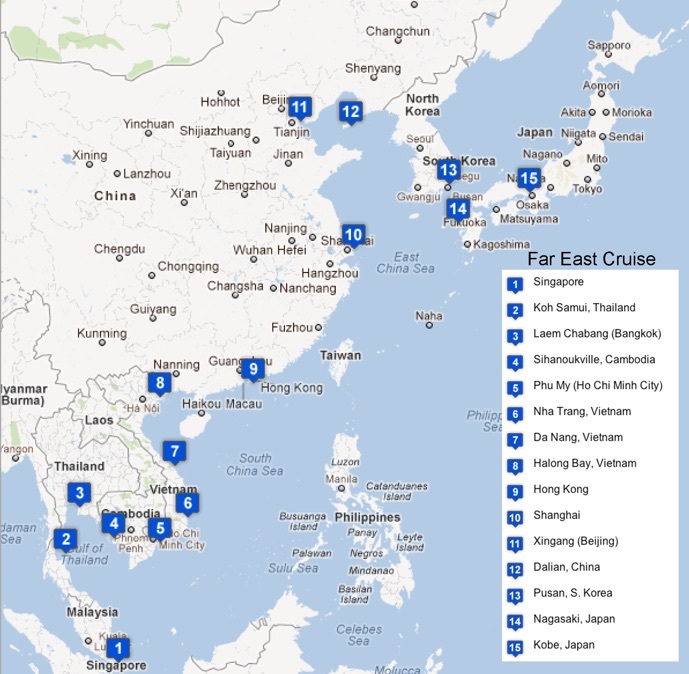 Monday, January 28-Depart NYC JFK at 1:55 PM for Bangkok via Hong Kong on Cathay Pacific Flight 831 (Business Class). 4. 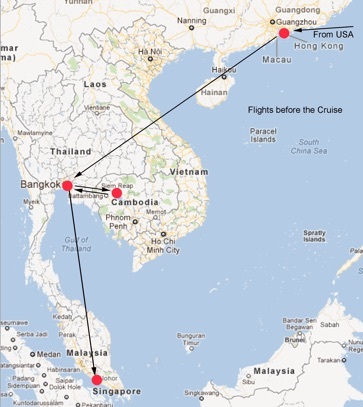 Tuesday, January 29-Arrive Hong Kong at 7:00 PM (8,067 miles). Depart Hong Kong at 8 PM on Cathay Pacific Flight 703 (Business Class) for Bangkok. Arrive Bangkok at 9:50 PM (1,071 miles). Hotel Novotel Bangkok Suvarnabhumi Airport. 5. Wednesday, January 30-Depart Bangkok for Siem Reap, Cambodia at 11:35 AM on Bangkok Airways Flight 905 (Economy Class). Arrive Siem Reap at 12:35 PM (222 miles). Afternoon trip in a car with driver to the Tonle Sap Lake for a sunset boat cruise. Heritage Suites Hotel. 6. Thursday, January 31-TukTuk Angkor Wat temples day trip with personal guide.Heritage Suites Hotel. 7. Friday, February 1-Depart Siem Reap for Bangkok at 1:25 PM on Bangkok Airways Flight 906 (Economy Class). Arrive Bangkok at 2:20 PM (222 miles). Hotel Novotel Bangkok Suvarnabhumi Airport. 10. Monday, February 4-Visit Raffles Hoteland the Gardens by the Bay. Depart Singapore on Holland America Volendam at 6 PM. 11. Tuesday, February 5-At Sea. 12. Wednesday, February 6-Arrive Koh Samui, Thailand at 8 AM. Travel in a 4-wheel-drive vehicle past local villages where Muslims and Buddhists live together in complete harmony. Stop at a typical Thai home to learn about coconuts, the island's original industry. Watch a trained monkey pluck a nut from high atop a coconut tree. Leave the vehicle and travel through the jungle on the back of an elephant. Watch a baby elephant show. Head to a local restaurant for lunch and then visit a rubber plantation to see how the farmers tap the trees for sap. Enjoy free time in the town to shop before returning to the ship. Depart Koh Samui at 3 PM. 13. Thursday, February 7-Arrive at Laem Chabang (Bangkok) at 8 AM. Following a bus transfer, board a boat for a river cruise into the colorful daily life of Bangkok. Cruise the klongs or canals and see canal grocery stores, houses on stilts and the Royal Barge dockyard. Glimpse how canal people live and work. Lunch at a riverside hotel and then bus through Chinatown's commercial district. Stop at a local flower market and continue to Bangkok's Marble Temple. A short time for shopping follows before returning to the ship. 14. Friday, February 8-Transfer by bus to visit the Sriracha Tiger Zoo. The zoo is a 100 acre facility and home to more than 200 Bengal tigers and 100,000 crocodiles. View the Amazing Circus show, and the Crocodile and Elephant shows. Hold and bottle feed a baby tiger before returning to the ship. DepartLaem Chabeng at 4 PM. 15. Saturday, February 9-ArriveSihanoukville, Cambodia at 8 AM. Enjoy a scenic overview of Sihanoukville, stopping at the Intra Ngean Pagoda, the city's most prominent religious site. Drive through the outskirts of town to Independence Beach and Ochheuteal Beach, facing the Gulf of Thailand. Stroll on the beach under the tall pines and visit the local market to see Khmer commerce. Visit the Tumnuk Rolok fishing village before returning to the ship. Depart Sihanoukville at 5 PM. 16. Sunday, February 10-At Sea. 17. Monday, February 11-Arrive Phu My, Vietnam at 6 AM. Travel two hours by motor coach to visit Ho Chi Minh City or Saigon. Drive through the heart of the city past the central square and the French-built Hotel de Ville (former town hall). Visit the City Museumto see the French heritage that has survived the current surge of development. The museum building once belonged to the Emperor Gia Long at the beginning of French rule in the mid-1800s. Since 1975, it has been a museum detailing the Communists struggle for power in Vietnam. Drive down Le Duan Boulevard to the city zoo and Botanic Gardens, founded in 1864. Enjoy a walk through the gardens to Notre Dame Cathedral. Enjoy lunch at a local hotel before visiting the former Presidential Palace, now Reunification Hall. A Vietnamese tank crashed through the front gates here in April, 1975, ending the Vietnam War. View the reception and dining rooms of the President's quarters and the basement still full of American telecommunications equipment and military maps. Visit a lacquer workshop before returning to the ship. Depart Phu My at 5 PM. 18. Tuesday, February 12-Arrive Nha Trang, Vietnam at 10 AM. Visit the Long Son Pagoda and then on to the home of a family whose business is weaving mats from the rushes growing nearby. Two persons produce four mats per day which are then sold at the local market. Visit a local home characterized by an altar reserved for ancestor worship. Stop at one of Nha Trang's beachfront cafes. Enjoy a snack here or take a quick swim. Finally, visit the XQ Embroidery workshop before returning to the ship. Depart Nha Trang at 11 PM. 19. Wednesday, February 13-At Sea. 20. Thursday, February 14-Arrive Da Nang, Vietnam at 7 AM. Board a rickshaw for a whirlwind tour of city streets to see landmarks such as the Han Market, the Da Nang Cathedral and the TV broadcasting station enroute to the Cham Museum. At the museum, see the sandstone-sculpted items which provide insight into the history of the Cham people. Continue to a final stop at China Beach, immortalized by the TV series, before returning to the ship. Visit Hoi An, one of Vietnam's most charming towns for lunch. Depart Da Nang at 5 PM. 21. Friday, February 15-At Sea. 22. Saturday, February 16-Arrive Halong Bay, Vietnam at 7 AM. Board a motor coach for the 3 1/2 hour ride to Hanoi. Visit Ba Dinh Square, also known as Ho Chi Minh Quarter. See Ho Chi Minh's Mausoleum and former home. Nearby, see the One Pillar Pagodaand step inside the Temple of Literature built in 1070 and dedicated to Confucius. This structure was Vietnam's first university. After lunch, visit Thirty-Six Streets, an ancient district of the essence of Vietnamese culture before returning to the ship. Depart Halong Bay at 8 PM. 23. Sunday, February 17-At Sea. 24. Monday, February 18-Arrive Hong Kongat 7 AM; Visit Hong Kong briefly for lunch and depart 4 PM. 25. Tuesday, February 19-At Sea. 26. Wednesday, February 20-At Sea. 27. Thursday, February 21-Arrive Shanghai at 8 AM. Leave the port of Shanghai and travel by the new high speed train to Hangzhou. Traveling at 180 mph, the train reaches Hangzhou in less than an hour. In Hangzhou, take a cruise on West Lake, surrounded by mountains and forests. Hangzhou was described by Marco Polo as the most beautiful city in the world. Enjoy a Chinese lunch at a local restaurant before moving to the Longjin Tea Plantation. At the plantation, learn about the cultivation and manufacture of tea products while tasting Longjin tea, Hangzhou's most famous product. Then, visitLingyin Temple, originally built by an Indian monk. Restored several times, the temple is one of the most visited Buddhist sites in China. Finally, re-board the high speed train for the return to Shanghai and the ship. 28. Friday, February 22-Take a coach ride to Long Yang Lu Station to board the Magnetic Levitation (Maglev) Train. The train can reach speeds of 260 mph and floats on an electromagnetic cushion along a guideway. Take the eight minute ride to Pudong Airportand then return to Long Yang Lu Station. Take the motor coach to the Lujiazui area of the Pudong New District, now the financial center of China. Visit the Jinmao Hyatt Building for a panoramic view of Shanghaibefore returning to the ship. Depart Shanghaiat 7:30 PM. 29. Saturday, February 23-At Sea. 30. Sunday, February 24-At Sea. 31. Monday, February 25-Arrive Xingang (Beijing) at 7 AM. Travel by private auto to Beijing (2 1/2 hours). In Beijing, visit theNational Theater. Have lunch with guide from 2004 China trip. After lunch, visit the 2008Olympic Park. Tour the Water Cube, site of Michael Phelp's eight Olympic medals. Visit the Bird's Nest Olympic Stadium. Briefly visit the Great Hall of the People and Tiananmen Square before returning by private auto to the ship at the Xingang port. 32. Tuesday, February 26-Depart Xingang at 7 PM. 33. Wednesday, February 27-Arrive Dalian, China at 11 AM. Leave the ship and visit a Chinese family in their home to learn about everyday life and customs. Then, visit the Pole Aquarium to see a variety of Polar animals. Enjoy a lunch of northern Chinese cuisine while being entertained by children performing a song and dance show. Continue to People's Square (once named Stalin Square) located in the center of Dalian. Dalian's ice-free port was completed by the Japanese in 1930. After World War II, the city passed to Soviet control and back to China in 1954. Finally, visit a nursery school to spend some time with the children before returning to the ship. Depart Dalian at 8 PM. 34. Thursday, February 28-At Sea. 35. Friday, March 1-Arrive Pusan, S. Korea at 8 AM. Leave the ship to visit Yongdusan Park, located near the fish market and Gukje International Market. Stop at the fish market and learn about the huge fishing port at Pusan. The Jagalchi Festival is held here every October. Finally, visit Gukje Market with its wide variety of goods and local food items, before returning to the ship. Depart Pusan at 5 PM. 36. 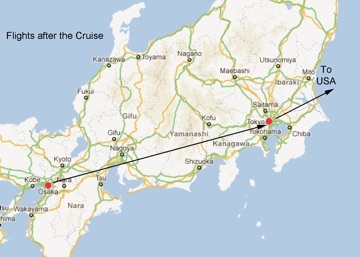 Saturday, March 2-Arrive Nagasaki, Japan at 7 AM. Opened to foreign trade in 1570, Nagasaki flourished as the sole portal of Western culture into Japan during its isolation period. Christian culture and foreign learning found their way into Japan through Nagasaki and it became a center for shipbuilding, mining, printing and medicine. Visit the Nagasaki Peace Park, a place of remembrance of the atomic bomb explosion here on August 9, 1945. Finally, visit theAtomic Bomb Museum before returning to the ship. Depart Nagasaki at 6 PM. 37. Sunday, March 3-At Sea. 38. Monday, March 4-Arrive Kobe, Japan at 7 AM. Disembark from the Volendam. Travel by auto to Kyoto. In Kyoto, visit the bamboo forest at Arashiyama and drive through an historically preserved street. Visit theOtagina Nenbutsuji Buddhist Temple and therock garden at the Ryoanji Temple. Finally, visit Kyoto's Golden Pavilion Temple before boarding the Bullet Train to Tokyo. Park Hotel. 39. Tuesday, March 5-Tour Tokyo including the Tokyo Tower, the Meiji shrine and theImperial Palace grounds. After lunch, visitHamarikyu Gardens and cruise on theSumida River. Visit the Asakusa area to view a shopping street and a Buddhist temple. Tokyo, Park Hotel. 40. Wednesday, March 6-In the morning, visit the Imperial Hotel and Ginza. Tour the Tsukiji fish market before lunch. Depart Tokyo at 7:10 PM on American Airlines Flight 60 (Business Class); arrive Dallas Ft. Worth at 3:45 PM (6,513 miles. Depart Dallas Fort Worth at 6:05 PM on American Airlines Flight 1188 (First Class); arrive Washington Dulles at 9:50 PM (1,185 miles).